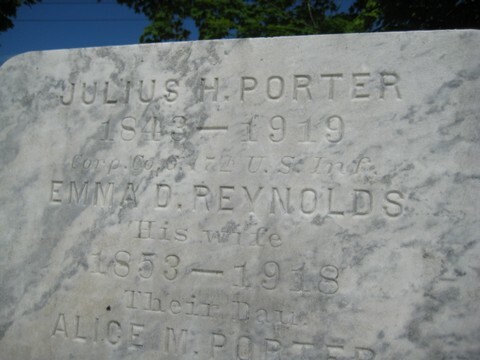 Julius Henry Porter was the third of five children born to Calvin Porter and Mehitable Judkins. He was born in Hartford, Vermont, on September 11, 1843. The 1860 U.S. Census shows Julius Porter living in Hartford, Vermont, at the time of his enlistment. He enlisted at age 18 ½ on April 9, 1862, at Lebanon, New Hampshire. His military records describe him as between 5'6" and 5'9" tall (conflicting records), with dark complexion, brown eyes, and dark brown hair. Julius was assigned to Co. G, 17th U.S. Infantry. (His brother, Orvis W. Porter served in the same regiment). Julius enlisted on June 6, 1862, from Fort Columbus, New York. He participated in the Second Battle of Bull Run in August 1862. Julius deserted on November 3, 1862. In his Declaration for Original Invalid Pension, his physical description includes "Partial deafness of left ear contracted at the second battle of Bull Run by explosion of gun. He surrendered on May 26, 1865, under the President's Proclamation. He was restored to duty without trial on condition that he made good his time lost. Company G served in Maine and New York from July 1, 1865, to April 6, 1866, and then in Texas until September 1866. Julius was elevated to Corporal on January 1, 1867, and honorably discharged on November 1, 1867, at Woodsville, Texas. He received Pension Certificate No. 1034871. In addition to his partial deafness, he claimed rheumatism contracted in the line of his duty, as well as chronic heart disease. His parents sold property to Julius in Hartford. He lived there one year, then moved on to Norwich for 6 ½ years. A year after his discharge, he married Harriet M. Foster. Hattie, as she was known, was born in Norwich in 1849 to Hiram Foster; her mother's surname was Culver. The marriage took place in Hartford on November 16, 1868, with William Sewell, Minister, officiating. Hattie was a resident of Norwich, aged 19. Julius was 25, and occupied as a farmer. They had four children before she died in Norwich, on November 10, 1873. Julius next married Emma D. Reynolds, born in 1853. According to Julius' pension records, his family next spent two years in Warren, 3 ½ years in Sharon, 1 year in Charlestown, NH, then 30 years combined in Langdon and Alstead. They were in Alstead by the 1890 Veterans Census. Emma's brother may have lived with them, as there is a Lovell Reynolds, 1869-1946, buried next to her and Julius. Julius' federal pension in 1901 was $6 per month. In 1902 he filed for a pension increase, and received a raise to $8. Beginning March 2, 1907, his pension was $12. Starting September 11, 1913, he received $20 per month. On September 11, 1918, he began receiving $24. In 1919, the amount was at $35 per month. 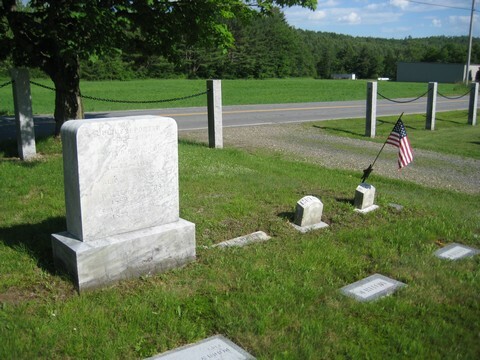 Julius was a member of Post 9 of the GAR, New Hampshire Commandery. A photo of this group used to hang in the Alstead Town Hall but has been relocated to the Alstead Historical Society. It also is pictured in the book, The History of Alstead. Julius died November 1, 1919. His wife also died in 1919, and they are buried in the Langdon Cemetery. Julius is believed to have been descended from William Porter, who served at Fort No. 4 in Charlestown, New Hampshire. His 15 children were named Newell H., Bela J., Will A., Hattie I., Lela A., Henry O., Mehitable J., Elizabeth, Fred C., Hattie E., Albert J., George Q., Alice M., Inez May, and Abigail Jane. From this 15th child is descended James Flanders." Source: Family, census, service and pension records held by the family. Contributed by Vicki Duckless Flanders, James Flanders' wife.